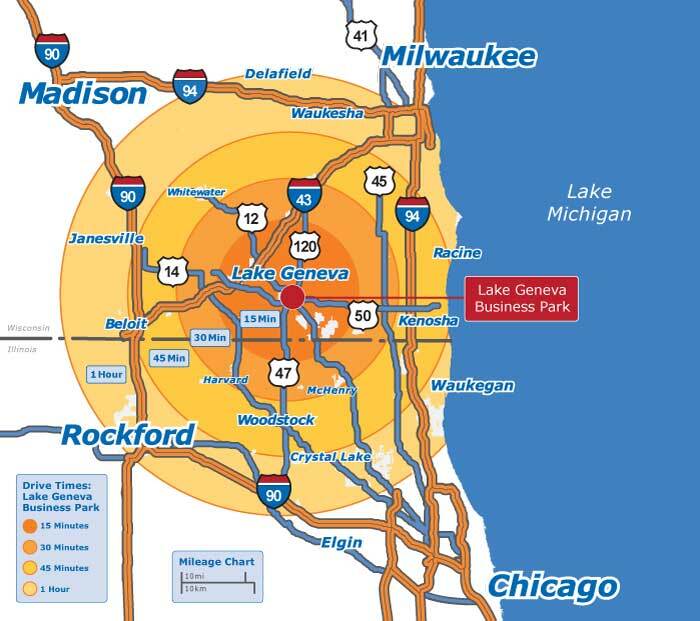 Located just off of US HWY 12 and WI HWY 50 in the City of Lake Geneva, the Lake Geneva Business Park is home to 46 companies serving a variety of industries including manufacturing and distribution, medical, real estate/construction service, veterinary clinic, professional services, person services, and other services. Due to the City of Lake Geneva’s central location between Madison, Milwaukee, Chicago, and Rockford, businesses have access to the available resources of dozens of colleges, universities, and private research firms, including two Walworth County based institutions – the University of Wisconsin-Whitewater and George Williams College of Aurora University. Since its inception, the exclusive developer of the Lake Geneva Business Park has been the Lake Geneva Economic Development Corporation (LGEDC), a private non-profit organization created to promote job growth and development in the City of Lake Geneva. For the MLG Information sheet on the business park, click here.